Yurie Mitsuhashi appeared on Show 205, recorded in November 2009, at age 17. Yurie Mitsuhashi (violin), 18, is a recipient of From the Top’s Jack Kent Cooke Young Artist Award. Originally from Japan, Yurie was first exposed to music by her mother who is a pianist. Now a senior at Fort Lee High School in her hometown of Fort Lee, New Jersey, she studies music at the Lucy Moses School Young Artist Program in New York. 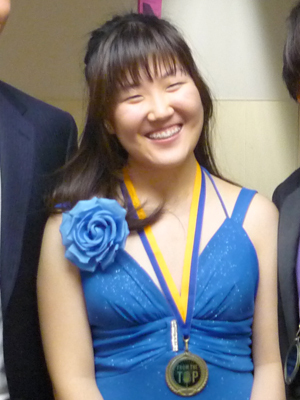 Yurie is a member of the marching band, sings in her school’s Honor Choir, and performed with her violin trio at the Lincoln Center Young Musicians Concert in New York in April 2009. Yurie is a Jack Kent Cooke Young Artist.